Sydney PEN's anthology of refugee writing, Another Country, was launched by Australian actor Claudia Karvan on May 16 2004 at Gleebooks. 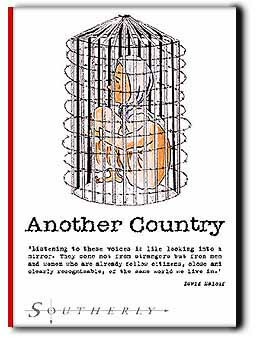 The anthology Another Country includes writing by 30 detainees, refugees and former asylum seekers. The book was edited by Sydney writers Rosie Scott and Tom Keneally from the Sydney PEN Writers in Detention committee. Another Country's special front cover is displayed on this page. The 100 copies are numbered, and autographed by both Rosie Scott and Tom Keneally. At Project SafeCom we will be giving away, by raffle, four numbered copies to our supporters - for donations received of $25.00 and more: Issue Numbers 38, 39, 40 and 41 will be raffled on or shortly after World Refugee Day 2004 (20 June 2004). All four copies are signed by Rosie Scott and Tom Keneally. This raffle is now closed, but we're leaving this page in place for your reading! This raffle is open NOW and closes at the end of our events on World Refugee Day 2004, Sunday 20 June. Four people with WINNING submissions will be notified by phone after the raffle of names of all people who sent a donation between now and June 20, has been drawn. All donations of $25.00 or more will have an equal chance of being a winner. Distinguished poets and fiction writers, such as Adeeb Kamal Al-Deen, Yahia As-Samawi and Nasrin Mahoutchi, refugees now living permanently in Australia. Former detainees, such as the talented poet Mohsen Soltany Zand and human rights award winner Dr Aamer Sultan, who are still trying to come to terms with their horrible experiences in the detention centres. Journalists, playwrights, fiction writers, poets, & cartoonists such as Shahin Shafaei and Cheikh Kone. One writer, Hassan Sabbagh was released only in March from Villawood Detention Centre after being detained for four years and three months. Sydney PEN and International PEN campaigned for his release. The anthology is published as a special limited edition of the Southerly literary magazine by Halstead press. "Listening to these voices is like looking into a mirror. They come not from strangers but from men and women who are already fellow citizens, close and clearly recognisable, of the same world we live in." - David Malouf, novelist and Sydney PEN member. Because death is better than the real world. Click the image to open the inside page of autographed issue #37. This stunning and unforgettable collection of refugees' writing has been brought together by Rosie Scott and Thomas Keneally on behalf of Sydney PEN. Contributors include distinguished Arabic poets and story tellers like Adeeb Kamal Al Deen, Yahia as-Samawi (considered to be one of the best living Arabic poets) and Nasrin Mahoutchi, refugees now living in Australia. There are detainees Mary Yousefi, Tony Zandavar, Hassan Sabbagh and Rahman Shiri. 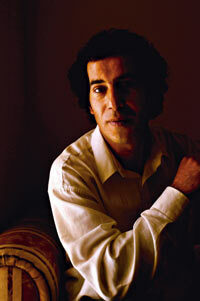 There are ex-detainees like talented poet Mohsen Soltany and human rights award winner Dr Aamer Sultan. These are journalists, playwrights, fiction writers, poets and cartoonists whose escape from tyranny in their own countries has made them strong enough to speak out eloquently against injustice here. The writer Ahmad Shah Abed left Afghanistan to avoid forced recruitment by the Taliban. "They started collecting young lads again and many people were killed," he writes. He is in a psychiatric hospital after three years in detention in Port Hedland. Mary Yousefi, an Iranian secretary still in Baxter after three years, writes: "My son finds it hard to sleep and when he does he has very bad nightmares and wakes up screaming." The journalist Cheikh Kone fled Africa after penning an article critical of the Ivory Coast Government. He spent three years at Port Hedland, and writes: "... we have been painted as criminals and terrorists ... we have been dehumanised and our plight ignored". These stories come from Another Country, a collection of refugees' writing published this week, giving voices to people usually not heard. They show the consequences of the Federal Government's actions, which were examined in detail in the Human Rights and Equal Opportunity Commission's report on Australia's immigration detention policy regarding children. The commission measured the Government's policies and practices against the United Nations' Convention on the Rights of the Child, to which Australia is a signatory. That convention requires detention of children to be a measure of last resort - Australia uses it as the measure of first resort for all children, irrespective of their individual situation. That detention, the commission says, is "automatic, indeterminate, arbitrary and effectively unreviewable". Imprisoned children are exposed to riots, fires, hunger strikes, protests, lip-sewing, suicide attempts, tear gas and water cannons. They see razor wire and feel frightened and unsafe. Their health - physical and mental - suffers. The trauma that led them to flee to Australia - 93 per cent of children in detention are eventually granted refugee status - is compounded by their treatment in what they thought would be a haven. "No other country in the world has a policy like this," writes the commission, not in praise. It attacks as mean-spirited and destructive a Federal Government policy which goes way beyond the stated aim of border protection. The Federal Government justifies its approach, and maintains a level of support for it, in two ways. It states that the Government should decide who is allowed to enter the country. But it also ensures Australians are ill informed about who these refugees are. Detention centres are placed in deserts and on remote islands; it denies access to most visitors and to the media; and uses terms such as "illegals" and "queue-jumpers". But reports such as the commission's, and books like Another Country, provide an alternative view - that asylum seekers are people rather than numbers, that Australia provides punishment rather than refuge, and that children detained suffer enormously. Overhauling detention laws and practices regarding children, as the commission recommends, is the starting point for a reassessment of Australia's treatment of asylum seekers. It's a way of coping with the rigours of detention: to get the desperate thoughts out on paper to try to make sense of it all, writes Sharon Verghis. Mohsen Soltany Zand's voice is initially soft, the words coming reluctantly as we speak on the phone. He doesn't really want to talk about the past - it is not a benign thing, full of pleasant memories, but dark, sharp and equipped with teeth. Zand lives in Chippendale, writes poetry, is studying a surveying course at TAFE, and turned 34 recently. He has a beautiful voice, soft-edged with rolling "r"s, mellifluous and warm despite the halting, brittle speech. He came to Australia in 1999 from Iran and was held in Port Hedland and Villawood as an illegal immigrant for more than four years. Since his release, he has been trying to make sense of his life, those four lost years and what he will do now that the bars are gone. One thing is constant - his poetry, which he writes to exorcise, or at least make peace with, ghosts. Since being detained, it has moved from hobby to a kind of therapy, something he now uses to express a raw sense of injustice. A poem, Dream of Freedom, speaks bluntly and plainly of the suicidal thoughts he experienced while incarcerated - "I can see freedom, the red of nature's sunset/ and God on a sharp razor". Another, Drought, describes the plight of refugees caught in bureaucratic limbo as "bogged in mud like cows". Yesterday, Zand's work, featured as part of a collection of writing from 30 detainees, refugees and former asylum seekers, launched in Sydney. The anthology, Another Country, published as a special edition of the Southerly literary magazine, will feature in a panel session presented by Sydney PEN Centre at the Sydney Writers Festival at the Sydney Theatre on Sunday, May 23. Edited by Rosie Scott and Tom Keneally from the Sydney PEN Writers in Detention committee, it presents the voices of those still incarcerated as well as those who have won their freedom. Like Zand, Iraqi refugee Hussein Ali Al-Hashimi found some measure of sanity and peace in poetry while in detention in Woomera in 2000. Now on a temporary protection visa, he struggles to make sense of his situation. Like Zand, he is well aware of how people like him have been demonised as "terrorists" or "queue jumpers", and hopes the poetry anthology will somehow give them a human face, a real voice. "I still write," he says simply. "With my situation, I can't do nothing else." Keneally is hopeful that the book will offer a passionately presented argument against the prevailing views about asylum seekers. "This is a tiny antibody put into the bloodstream of the body politic," he says. "We have a Government that runs down, demonises, refugees ... we wanted to show their human voices, to show they share the same desires for personal space and personal freedom as we do." The writings, sourced with the help of refugee advocates and community leaders, make for striking reading. The Iranian poet Mohammed Reza "Tony" Zandavar is singled out for high praise by Keneally, as is the Iraqi journalist and poet Adeeb Kamal Al-Deen, Ivory Coast political refugee Cheikh Kone and Zand. Their poems and writing document a shared pattern - flight from repression, from fear, to imprisonment, and fear. There is bewilderment and rage in some verses, a numbness and almost fatalistic resignation in others. Keneally was struck, too, by an anonymous piece called Letter from Three Women - a bare-boned, stark and sad document, prosaic rather than poetic. The three inmates, all pregnant, identify themselves by how many months they are into their pregnancy - six, seven and eight months respectively - before putting forward a pitiful list of requests. "Our cloths is very narrow ... we need wide cloths to be comfortable because our abdomen is increase in size gradually", they write. In short, fractured sentences, they ask plaintively, too, for flat shoes, extra milk and orange juice, and "identity carts". One upside of tyranny is the way it acts as a spur to creativity, Keneally says, only partly tongue-in-cheek. Reams of poetry and verse are being written in the country's detention centres, while outside them, a thriving "refugee art" genre has emerged on the country's stages, concert halls and theatres in the past few years. He believes that after a slow start, people are being galvanised to take action through the sheer weight of private conscience, and developments in the political domain. "It takes time for a head of opposition and dissent to grow," he says. "I've been in America recently, and the same thing is happening there. "A lot of Americans are starting to state their opposition to their Government's present policies, to things being done in their name."